The Courage Lion Program was developed in cooperation with the Johns Hopkins Children’s Center to help children and adolescents discover their inner strength for coping with a variety of crises. The program provides therapeutic solutions to propel a journey of healing through bolstering courage, facilitating communication and engendering hope. Since the launch in 2006, the program has experienced extraordinary success and growth to over 136 hospitals, military organizations, hospices and other outreach efforts, impacting the lives of 46,000 children, adolescents and their families. Dynamic reality DVD of “Courage Roars” for pre-teens, teens, and young adults on developing the courage necessary to navigate the challenges of life. Courage Unlimited Corporation is a 501(c)(3) volunteer, non-profit, tax deductible organization that provides the Courage Lion Program free to our network of hospitals, etc. Funding is derived from compassionate individuals, organizations, and corporations in each community. 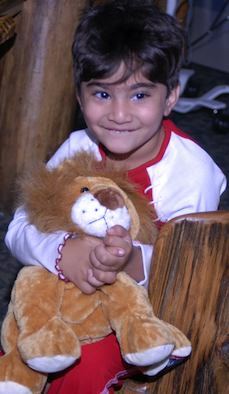 The Volunteer Courage Lion Program is a gift from the heart of the community. Its relentless dedication to easing the pain, fears, and grief of children in crisis have earned it local, national and international acclaim. The need is great in the United Stated and Canada as 550,000 children enter critical care facilities and 38,000 die annually, with millions more experiencing a multitude of crises. Your support is needed now! Become a Courage Lion Champion and make a roaring difference to a critically ill, traumatized, abused, or grieving child with your tax deductible donation.